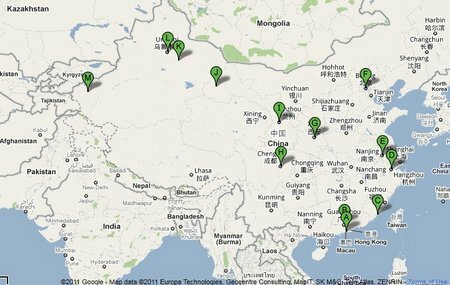 This is the map I used to describe our intended China itinerary in my brief “Phase III: China” post in early April. What I didn’t mention at the time was how nervous I was about visiting Western China. Pick a concern (food, language, hygiene, transport, possible ethnic violence) and I’m sure I wound myself up in knots worrying about it – without even once considering changing our itinerary. The adrenalin rush that comes from such stresses is why I am a travel junkie. Point J on the map is Jiayuguan, point K is Turpan, Dunhuang is in between the two. I dithered about whether or not to stop in Dunhuang. The guidebooks raved about beautiful grape arbors in Turpan while Dunhuang seemed to be getting a travel-writer brush-off with descriptions of a “boring, modern city” even as the nearby Mogao Caves were cited as a must-see stop on any Silk Road itinerary. It was all very confusing really. In the end the physical distance facilitated our decision: we could get a daily bus from Jiayuguan to Dunhuang (5hrs) and then continue on with an overnight train journey from Dunhuang to Turpan. Perfect. We made a half-decision to stop in Dunhuang and see if we liked it and if not to continue on. This entry was posted in China, International Escapades and tagged China, China With Kids, Dunhuang, Singing Sand Dunes, Western China on June 6, 2011 by wandermom.